When I was a young lad I watched a lot of films, most of which were science fiction and in those days they often had deep and poignant meanings buried in their complex narratives. As a result The Hitchhiker's Guide to the Galaxy pretty much whizzed past me (much like a deadline) and I never really got the central joke which has since become more famous than the book itself; that 'the answer to the ultimate question of life, the universe and everything is 42'. Many geeks have since wasted years and futile efforts trying to ascribe some deep, symbolic significance to the number and its occurrences. It was only recently that I rediscovered Douglas Adams and was able to appreciate his incredible sense of humour and wit and the joke itself finally became clear to me. For those who don't know the book/radio series/TV show/movie (shame on you) a group of pan dimensional beings create a computer 'Deep Thought' to answer the titular question. It takes Deep Thought 7.5 million years to arrive at the answer 42 and when confronted at just how meaningless the answer appears to be, it points out that the beings that instructed it never really knew what the question was. When asked to produce the ultimate question, Deep Thought says it will design an even more powerful computer that will incorporate living beings into the computational matrix and will run for 10 million years. This computer will be called Earth. If I have already lost you then there is little point reading on but, if you see the irony in the above then read on for I believe the same applies very much to the teaching, or rather the attitudes towards the teaching of this great subject by those 'pan dimensional' (clearly alien) beings in government. If we consider that, as well as the argument that a meaningless answer is the response to an meaningless question, the idea that a question so profound if distilled into a single number would then 'seemingly' have no meaning whatsoever...much in the same way that Einstein took something as complex as the theory of relativity and presented it as E=mc2. Now, design and technology 'should be' a subject that addresses many facets of human life; creativity, self expression, self actualisation, the desire to discover and develop new technologies, problem solving, improving the quality of human life and many, many more. Much of these can be hard to quantify or to justify to a penny pinching educational manager or blinkered politician while some of these areas of focus are older than the study of maths, science or language; older even than the arts. Yet D&T is considered by many as something born in the comprehensive schools of the late 80's and still dragging its poor handicraft relatives around antiquated workshops to this day. Without even factoring in the creative and expressive aspects of the subject, here is an area of study which, in any alternative universe, would be considered possibly the most important for humans to study, learn from and apply in order to improve the future of human life on this planet. But no, this is a subject which, in the eyes of those eager to support the EBacc, Progress 8 and other visionless educational initiatives that seek to diminish the importance of creative education, seems to have no place in their modern classrooms. Those same narrow minded individuals may ask the question 'What is the meaning or purpose of design and technology?' and over many years of mulling over the question you might well counter with 'Its purpose is as important as life itself for without design and technology, we have no future'...but like the central joke I alluded to earlier, that may be just too profound for them to understand...so you will spend another few years working out how to dilute all the creative and technical knowledge of humankind into something your 'Oxbridge' obsessed educational leaders can actually understand. Perhaps the title could be changed to 'Strife, The You Inverse and Reverie Sting', to make it seem even more intellectual; that will have them reaching for their thesauri. So, dear reader, sit smugly and reassured safe in the knowledge that the subject you have chosen to teach is integral to modern life itself but that there are those who will simply never understand just how important it is, always has been and will be in the future. For such luddites who still refer to the whole concept of design and technology education as 'woodwork' simply tell them what they want to hear even if they still don't quite understand. 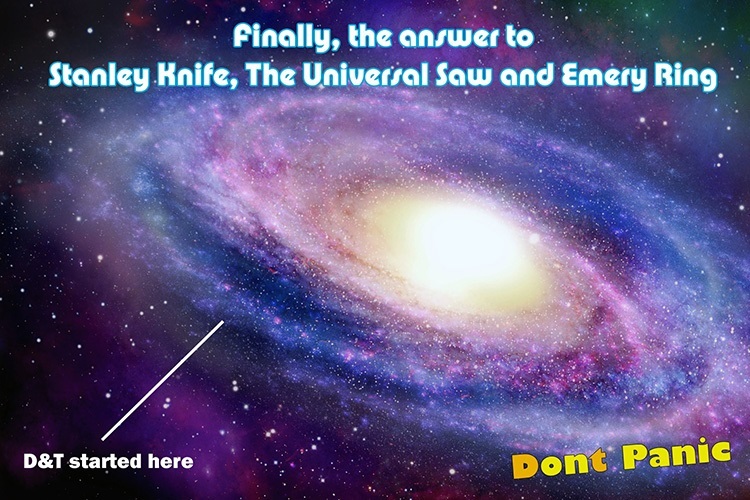 Tell them the answer to Stanley Knife, the Universal Saw and Emery Ring is 4" by 2".